Never have I seen so much Pink and Green before coming to Mangueira. The colours of the district cover every square inch of the Vila Olimpica Complex, where we have been working for the last week. The main focus of our time here so far has been with the boys at Casa Lar, which, as the week has progressed, has proved to be very rewarding. To start with, we were all a bit apprehensive; the language barrier, mixed with our initial lack of knowledge of the boy´s problems, made communication with them a bit of a challenge. However, the constant proximity to the boys, our domestic duties of getting them up, taking them to and from school, helping with the washing ...has made sure we´ve got to get to know them very quickly. They´ve each got their own distinct, quirky and uncompromising character. There is certainly a lot to keep you busy here. When you are not on domestic duties, you´ll be preparing activities and outings. 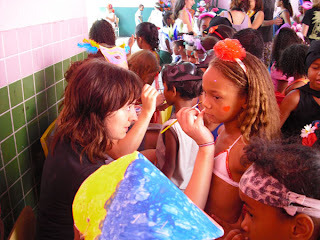 So far we´ve had treasure hunts, trips to the beach and park, jewellery making and preparations for the carnival. The language barrier is soon to fade; I have never felt such a constant figure of attention. Be prepared for lots of hugging and hand shaking, plenty of obscure questions and a LOT of singing! You´ll find it impossible not to communicate with these boys!. This is also the case of the Tia Neuma´s 5 to 7 year old children. These are children who go to a mainstream primary school also at the Vila Olimpica Complex. This week we have been preparing and teaching lessons to them. We have found practical, hands on lessons of butterfly and flag painting and snowflake making the most hectic, yet enormous fun! Next week we begin making costumes with them for their very own carnival party at school. After a day´s work, the team is generally pretty wiped out. As rewarding as the work is, it can be exhausting. However, there is a great balance of work and time to chill out here. The complex has a swimming pool which we are free to use most nights, and we have also had the opportunity of being taught by the most impressive Capoeira teachers I have ever seen- expect some gravity defying moves! In addition to all of this, it´s a very exciting time to be in Rio and we´ve already had plenty of chances to get a taste for the much anticipated Carnival. Already we´ve attended to parade rehearsals, street blocos, and several other carnival preparations around Rio. By the end of a Day at the Vila Olimpica, you have certainly earned your Caipirinha!!!!!! !